I practiced calligraphy today and found the brush old and wouldn’t much listen. I wanted a stroke to be pointed but couldn’t make it pointed. I wanted it thin but couldn’t make it thin. I wanted it thick but couldn’t make it thick. I said, no matter, I will continue to practice. I discover that when I practice calligraphy, I feel entirely lost in it and don’t think too much about things. At times, however, in my heart, I talk to you. I say, Dad, thank you. In life, you left a good deal of wisdom to your loved ones. Only after I have grown up have I slowly come to understand and appreciate this. So today I often think about the words you said to me. My characters now have a little strength. I am also beginning to feel a bit more free. It’s too bad that I don’t understand what I am writing! * Maybe I should go back to Taiwan to learn Chinese again. It is not easy to come by if a person can feel happy and natural in doing something. I know that if I go back to work at the bank, I will not feel my life is fulfilled. For the short term, it is ok. Next week, a bank has asked me back for another interview. I really wish that you would spend more time in the U.S. Older sister has said this to me also. Where she lives, it is comfortable with good places to walk. There are lots of birds and small animals. The weather does not get too cold. I used a camera to take a picture of my calligraphy today and have pasted it here for you. *The characters here are copied from the zi tie of Yan Zhen Qing (顏真卿) and are written in 古文 [gǔwén] which is the language used in classical texts. The written form of the modern spoken Chinese language (白话文 [báihuàwén]) did not come into existence until the early 20th century. 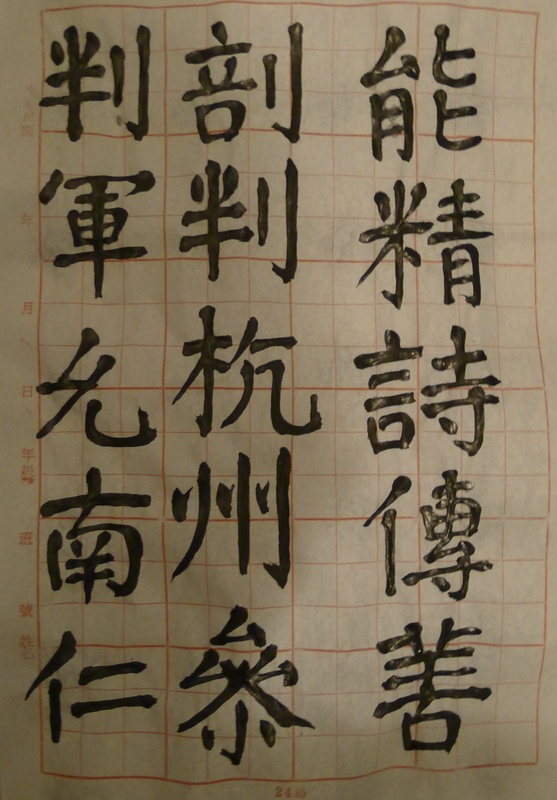 This entry was posted in Art, Chinese calligraphy, Language and tagged classical Chinese by wodezitie. Bookmark the permalink. Thank you for the repost. I really like your poetry sections and what I’ve seen of your blog and look forward to seeing more.